On 31st of March 2014, Burma Office Japan (BOJ) soundly fulfilled its role and closed. Among its numerous actions including organizing and attending meetings, demonstrations in Tokyo, talks with relevant Ministers of Japan, donations and publicity activities, its urgent action to protest against the Burmese Election Law in the 22nd April 2010 should be highlighted. BOJ, RENGO and other related Burmese organizations held rally at Gotanda Minami Koen Park to protest against the election law which intends to exclude democratization movement leaders and democratic organizations from political circles. Also, they attended a march to Burma embassy to demand release of all political prisoners including Aung San Suu Kyi and realization of democracy. 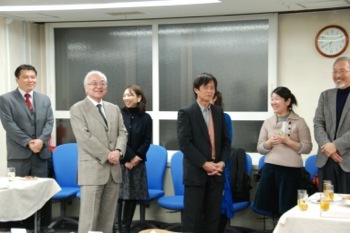 BOJ along with RENGO, held its closing ceremony on 5th March, 2014. Following an opening remarks by Brother Nobuyuki KOGA, RENGO President, Brother Shigeru NAKAJIMA, Director of the ITUC Myanmar Office and then RENGO Executive Director for International Affairs at the same time of opening of BOJ, addressed to more than 80 people including many Burmese people. Also attended were Mr. Yoshinori SUEMATSU and Mr. Michihiro ISHIBASHI, Members of the Parliament, Mr. Mai kyaw Oo, NDF Representative and Brother Rikio KOZU, RENGO General Secretary. Mr. Maung Min Nyo, General Secretary of the BOJ, who was unfortunately not able to attend to the ceremony due to passport problem in Myanmar, sent a message to appreciate support given to BOJ for 13 years. 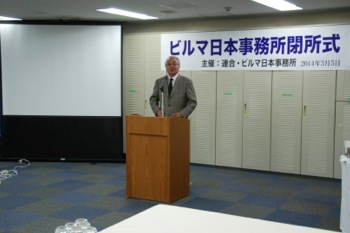 Mr. Noriyuki SUZUKI, General Secretary of the ITUC-AP, also sent a message to Closing Ceremony of the Burma Office Japan. The details are as per attached sheet. Though there remain lots of problem including forced labor and violation of freedom of association, Myanmar made progress on democratization as union leaders who had been forced to seek asylum were able to go back to Myanmar for the first time in two decades. In this situation, RENGO is determined to keep supporting the people or the organizations which make best effort to achieve their goal.